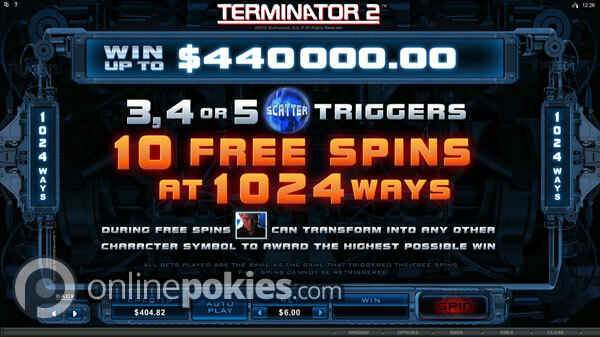 Terminator 2 is a Microgaming pokie based on the movie starring Arnold Schwarzenegger. 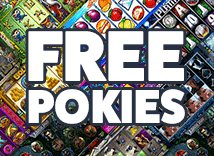 During regular play you have 243 ways to win and this is boosted to a big 1024 ways when on the free games. The Terminator 2 - Judgement Day movie directed by James Cameron and starring Arnold Schwarzenegger was a box office hit grossing over $200 million worldwide. 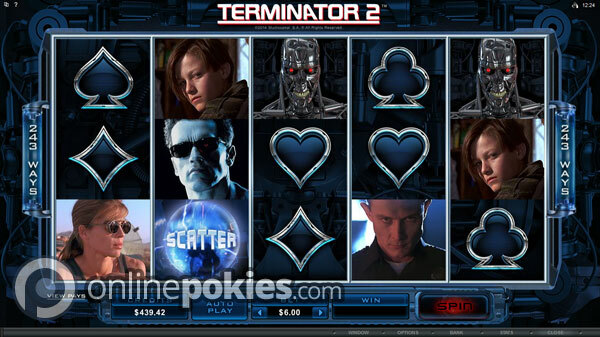 You can now enjoy all of the action from the film with the official Terminator 2 online pokie from Microgaming. The game features 243 ways to win during the regular spins and this grows to a big 1024 ways on the free spins. The game features video clips from the movie and has a T-800 feature that changes your view to the view of the T-800 cyborg. A 30 credit bet covers all 243 ways and credit sizes range from 1c to 50c. You can choose to bet up to 10 credits per way which gives you a max bet range of between $3 and $150 a spin. The T2 logo is wild for all symbols except the scattered electric Globes that the terminators travel through time in. Getting five wilds on a single way pays a tidy 15,000 credit jackpot but this is not the highest possible jackpot the game offers. The T-800 Vision bonus can be triggered at the end of any non winning spin. It's a bit like the "You are Lucky" feature on More Chilli or Lucky 88 in the fact that it is always a bit of a surprise when it triggers. Once activated the reels turn red just as if you were seeing out of the eyes of the T-800. Any character symbols on the reels are then targeted and you win an instant cash prize. As well as the cash prizes the T-800 feature can award the free spins if you have one scattered Globe on the screen. We really like the fact that this feature turns a losing spin into a winning one and the fact that it can also trigger the free spins keeps things really exciting. The Globe symbols are scatters with three or more awarding 10 free games (or 1 via the T-800 feature). Once won the reels expand to a 4x5 layout and you get 1024 ways to win. The free spins cannot be re-triggered and don't have any extra multiplier but there is one extra feature and a special "Hot Mode". Each time you trigger the free games the reels are either blue (regular mode) or orange (hot mode). From our experience getting the hot mode is quite rare. You can get some nice wins during the regular free spins but to get the biggest wins you need to have hot mode active. This is due to the fact that hot mode uses a different set of reels with lots of extra high paying symbols and T-1000 symbols (Watch our Preview Video for an example). The extra feature is known as the Transforming Symbol bonus where during the free games the T-1000 cyborg can transform into the any other of the character symbols. This fits perfectly with the fact that the T-1000 could transform into anything during the film. Combine the T-1000 transforming wild symbol with the 1024 ways to win and you can get big wins on a lot of ways in a single spin. The maximum win on a single free spin is a huge 880,000 credits.